Another Writing Break - oops! Another week without writing but I do have a good excuse - really! You may remember from a previous blog post (you know, the one with the Vikings) that we are celebrating my husband's big birthday this year and in order to make it last as long as possible, we have been to Switzerland for a week. 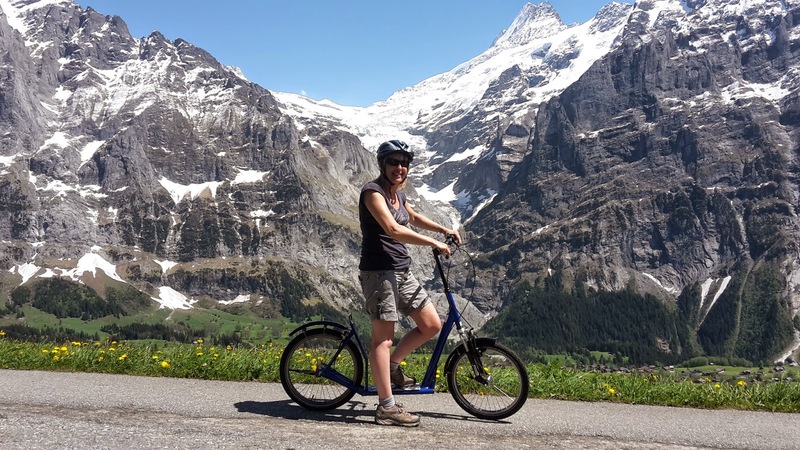 As it was also our fifth anniversary, we decided to push the boat out and stay at the fabulous Alpenrose hotel in Wengen. The journey, once we'd flown into Geneva, involved five trains (including the Panoramic Train from Montreux) and I have to say the Swiss trains are amazing and put ours to shame. What a wonderful way to travel. Even in the rain, the scenery was stunning but what we hadn't bargained for, as we wound our way through the Alps, was for the rain to turn to heavy snow! The scenery was transformed into a winter wonderland... and then the little cog train we were travelling on broke down! 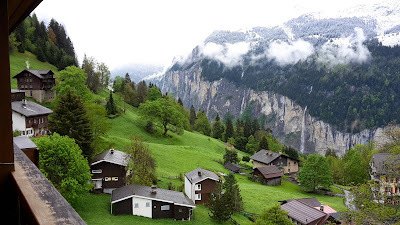 Before we could start to wonder which log cabin we'd be spending the night in, with super Swiss efficiency, the rescue train came to get us, we piled into a new train and managed to arrive at our beautiful village destination only a little late. The following morning we woke up to this sight from our balcony as most of the snow had melted in the valley. Over the next few days, we walked, we went up the mountains in cable cars, we rode 'trot bikes' (scooters with brakes) down mountain paths, we looked at the wild flowers, and we ate way too much apple strudel! 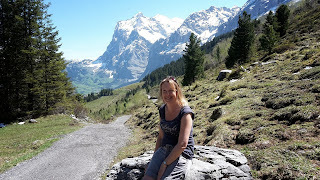 The most spectacular thing we did, though, had to be the journey through the Eiger mountain on a train to the highest station in Europe at the top of the Jungfrau. Now most of you will know that I hate tube trains but somehow this didn't affect me in the same way and to step out onto the glacier, once we'd reached our destination, was incredible. We walked to a mountain hut where the air was so thin we had to stop every few minutes to get our breath. It was worth it just to leave the crowds behind. I've never heard such perfect silence. "Ladies and gentleman. I am sorry for the delay. It was due to the lightning strike in Greece." As well as hating tubes, I am a nervous flier and couldn't believe his insensitive words. Which plane was struck? This one? Another one? I nearly got off and walked. It wasn't until I got home that I found out the lightning strike was an unexpected strike by air traffic controllers! A lesson in choosing your words carefully. A little bit of writing news before I go. For anyone interested, you still have time to read the two stories I have in The People's Friend Special - both written for the lovely illustrations my editor sent me. Today I'd like you to give a warm welcome to my guest, Alison May. She is the author of Choc Lit novel 'Sweet Nothing' and her second novel, 'Midsummer Dreams', is out in June. Alison is not only a rom-com author but a creative writing teacher and I decided she would be the ideal person to put this question to - what makes the perfect rom-com? Ah the rom-com. It’s a classic form in movies, books and television but what is it, and what elements make up a good one? Today I’m going to don my white coat of academic endeavour, head down to the great laboratory of writerly whatnots and do some analysis. The first element of a good rom-com is, of course, the rom, traditionally short, in this context, for romance, not roman. Although a roman-com would be awesome. It would probably involve people called Romanus going around the house. Anyway, romance, in my terribly humble opinion, is always born out of the characters doing the romancing. A hero doesn’t just need to be dishy and available – although both of those help – he needs to be the right hero for this one specific heroine. The pair either have to fill a gap in the other’s character or challenge some flaw in the other. So for a heroine like Cora, in Cora’s Christmas Kiss, who is obsessed with status, and achievement, her perfect hero could either be someone who helps her gain a sense of achievement or it could be someone who encourages her to relax and maybe be a wee bit less goal-oriented from time to time. Good romance also needs obstacles. At least it does in MadeUpStoryWorld. In real-life, meeting a nice guy or girl, asking them out, going out, having a nice time and getting together is utterly lovely, but, as anyone who’s ever been bored to death listening to a friend recount the details of their perfect date will know, it’s also really dull. Again the obstacles in a really good romance should be linked to the characters. If you have a confident and normally outspoken heroine you can’t give her an obstacle that could easily be resolved if she just mentioned it to somebody. Well you can, but you risk your poor reader throwing your book across the room in disgust. And just imagine that when they throw the book they strain their shoulder, forcing them to take time off work, and because this key staff member is off work their company loses out on a big contract, forcing them to make first your disgruntled reader, and then the entire workforce, redundant. It could happen. Poorly thought out plot points have consequences, you know. You have been warned. Time now for the second element of the great rom-com formula: the com. Comedy is a tricky beast – utterly subjective, and liable to become entirely unfunny when subjected to close inspection. I’m a naturally analytical writer. I tend to break stories and characters down and think a lot about the building blocks of a novel, but with comedy that approach fails me. The one and only piece of advice I can offer is this: if it makes you laugh then the chances are that somewhere out there will be a reader who feels the same. The second one and only piece of advice is this: when writing a novel you will have to read your own words lots of times – certainly three or four, possibly closer to ten or fifteen – by the end of that process nothing you’ve written will be funny. It will all be stale, unimaginative and hateful. At that point you just have to remember that it was funny originally. If it made you laugh when you wrote it, then keep the faith. The words haven’t changed; you’re just reading them with a worn down, worn out, unamusable outlook. Writing a novel can do that to you unfortunately. So there you go. Here endeth the lesson in the twin disciplines of the rom and the com. Have good characters who fit together; present them with obstacles that are specific to them, and remember to keep the faith in the funny stuff. And now you have no excuse not to sit down and write the perfect rom-com! Thank you for joining us today, Alison and the best of luck with your new novel when it comes out next month. 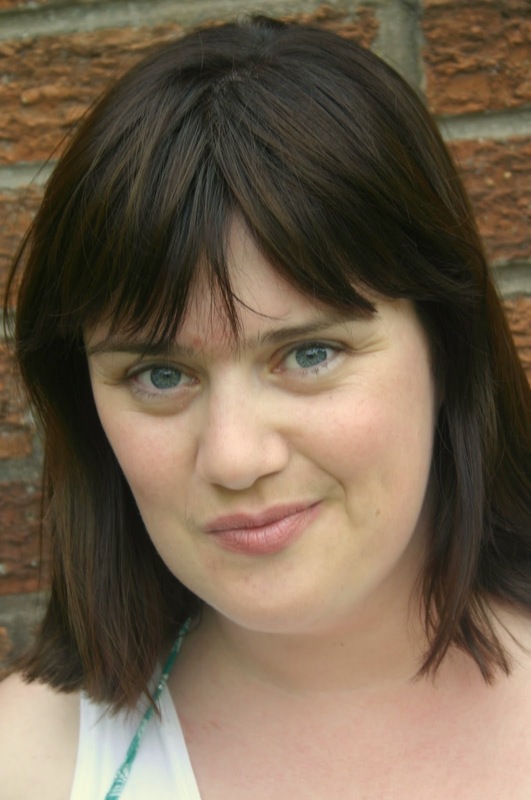 Alison is a member of the Romantic Novelists' Association, and won the Elizabeth Goudge Trophy in 2012. She writes contemporary romantic comedies, published by Choc Lit. 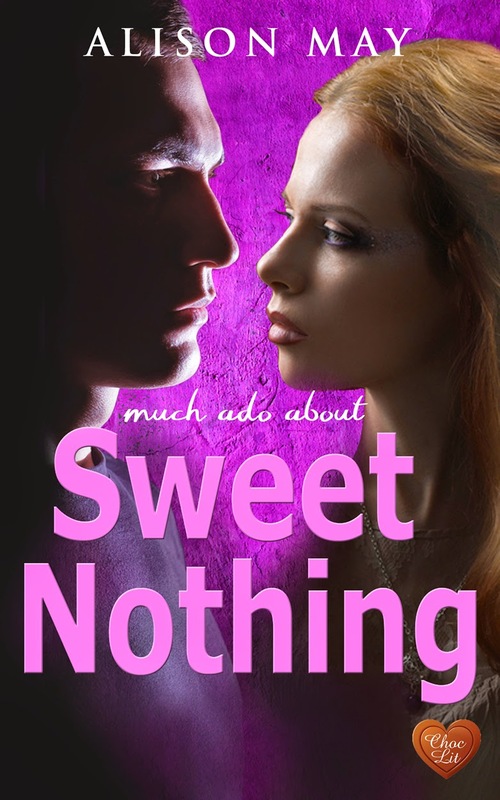 Her first full-length novel, Sweet Nothing, is available as for kindle now and to pre-order in paperback, and her second, Midsummer Dreams is out in June. Alison has also written two Christmas Kiss novellas, both available as ebooks now. It's 876 AD and, with a battle cry, hundreds of Viking warriors run up the hillside towards Corfe Castle and the waiting Saxons. Well OK, it's actually 2015 and my husband and I are having a weekend away (yes another!) to celebrate his 50th birthday. What we didn't know was that the bank holiday weekend was the annual re-enactment of the Siege of Wareham. When we arrived, and saw the village swarming with Vikings, we nearly turned back, but do you know, it actually made it a great experience. For a start, where else are you likely to share a pub table with a couple of Saxons in full regalia and a guy who looks like he's come out of an Asterix comic? On Saturday, we visited the castle itself. I haven't been to this part of Dorset for a long while and Corfe Castle really is quite spectacular, sitting on top of its hill, looking down upon the Purbeck village that shares its name. Because of the re-enactment, the castle grounds were strewn with siege tents and on the ridge below the castle, Saxon villagers were displaying their traditional crafts, cooking on camp fires and drinking from cow horns. The mist hung above the encampment like a shroud and the whole scene was mystical and full of atmosphere. The main event though was the 'big' birthday and we had packed the car with all my husband's birthday presents and brought them with us. The one that kept us entertained for the longest was the brilliant cryptic crossword puzzle that fellow womag writer Viv Brown had created for us as a prize in a competition on her blog. We're not particularly good at crosswords but we managed about three quarters of them without resorting to sneaking a look at the solutions. All the clues were linked to items, places and events that were special and meaningful to us and I'd like to thank Viv once again for a wonderful present. 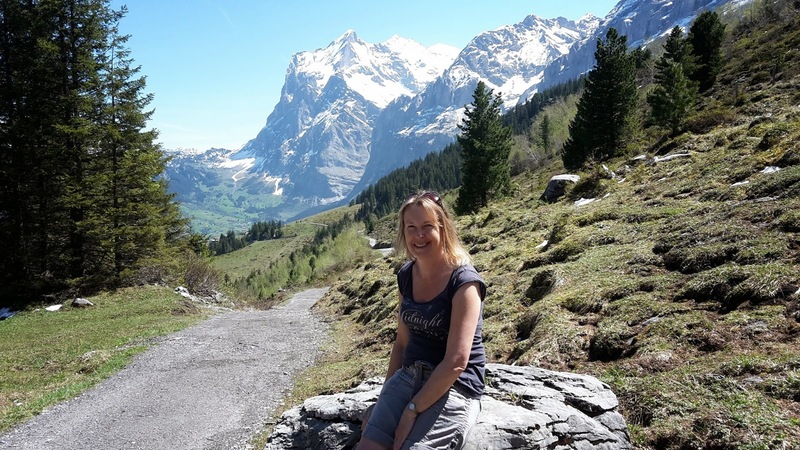 While I was away, I was guest on 'A Woman's Wisdom' blog, talking about the ten things I have learnt since becoming a writer. Do pop over and have a look - you might be amused! You can read it here. One of the things I wrote was that, rather than trying to fit in with a magazine's style, it can sometimes pay off to write something a little different in order to stand out from the crowd. 'Out on a Limb' is one such story. I confess I was surprised when I sold it to The People's Friend as it was very different to the usual stories they publish. It was bought a long time ago and I was wondering whether they had changed their minds about publishing it due to its quirkiness. But no... it is in this weeks magazine. Hurrah!